It’s a week to St. Patrick’s day. Around Ireland, celebration preparations are well underway for a festival and countrywide party of epic proportions. 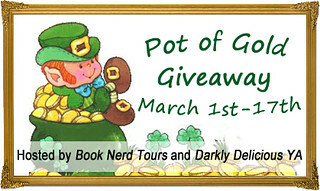 Meanwhile, over at Book Nerd Tours and Darkly Delicious YA the giveaway continues. It’s your chance to win a KINDLE FIRE HD stuffed with YA reads or one of THREE AMAZON GIFT CARDS. May the luck of the Irish rub off on you!